This book was published in 1998 so you may have missed it. I just have one word for you...DON'T. 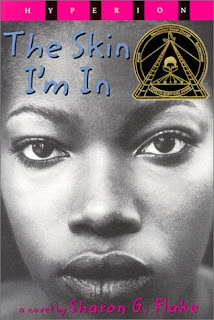 While the author is African American and the cover art portrays an African-American teenager, this book will speak to you whatever your ethnicity. FROM THE BACK COVER: Maleeka suffers every day from the taunts of the other kids in her class. If they're not getting at her about her homemade clothes or her good grades, it's about her dark skin. When a new teacher, whose face is blotched with a startling white patch, shows up at their school, Maleeka can see there is bound to be trouble for her, too. But the new teacher's attitude surprises Maleeka. Miss Saunders loves the skin she's in. Can Maleeka learn to do the same? This book is a mere 171 pages. A winner of the Coretta Scott King/John Steptoe Award for New Talent. If you haven't read it, request it at your local CMRLS library!